Vicky Zubiri imparts a bit of "peace and lightness" in her art exhibit, held for the benefit of The Child Protection Network. 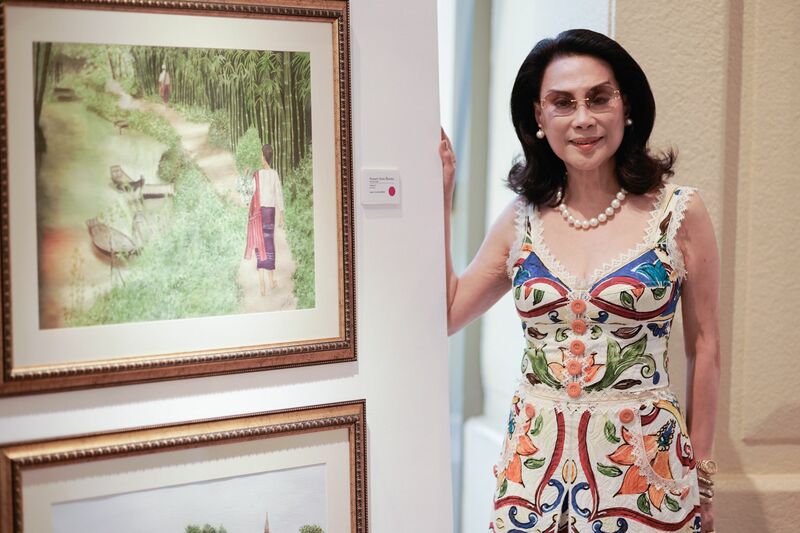 All 47 of her artworks depicting "an escapist exploration of landscapes and imagery through acrylic and watercolour" were sold out by the end of the launch on June 15. Nevertheless, the show is open to the public at the 3rd Floor Gallery of The Peninsula Manila until June 20. Vicky Fernandez-Zubiri Philanthropist An accomplished artist, she held her third solo show Of Peace and Lightness in June 2018. Maurice Arcache Author, Philippine Star The Bon Vivant awardee of the 6th Philippine Tatler Ball is still a beloved fixture in the Philippine social scene. Stephanie Kienle-Gonzalez Vice-president for sales and development, Philux Inc This Most Stylish awardee of the 2017 Philippine Tatler Ball is the COO of the furniture company Philux. Miguel Zubiri Senator, Republic of the Philippines The present Senate Majority Floor Leader pushes for the ratification of the Bangsamoro Basic Law, and the proposed Public Services Act.